Do you ever wish you could just laugh, when you really feel like crying? Join Teri as she speaks with best selling author and "jollytologist" Allen Klein about how laughter, especially during our darkest moments, can help guide us back to joyful living. Allen Klein, MA, CSP* (aka "Mr. Jollytologist®") is an award-winning professional keynote speaker and best-selling author who shows audiences worldwide how humor can help them deal with everyday trials and tribulations as well as triumphing over tragedy. 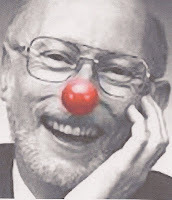 Allen is the 2009 recipient of the Lifetime Achievement Award from the Association for Aplied and Therapeutic Humor. Klein's books have been published in eight different languages (English, Spanish, Danish, Japanese, Korean, Chinese, Hungarian, and Turkish) with over 500,000 in print. Teri Williams, A.K.A. The Bliss Lady, has been living her bliss since they day she was born. Like YOU, she's had her share of ups and downs, she's simply found a way to turn those moments around and find the spark to keep her connected to her own joy. Her first passion is her family. She is wife, mother, daughter, sister, aunt, and includes her friends as part of that circle. Her work includes: Author, Publisher, Radio Co-Host, TV Producer, Ordained Minister, Energy Healer, Small Business Owner, Blogger, Connector and Thought Motivator. She shares her passion by empowering others to live the life of their dreams. Teri believes that what we are and what we do begins with love, self love. "We cannot fully love anyone or anything if we don't love ourselves first." Her books, The Blisstory Journal, The Sisstory Journal, and co-authored book, Girlavanting, The Girls Guide to Balance, Bliss and Fun!" are all celebrations of life, with engaging, entertaining and sometimes enlightening questions, actions and activities to revel in. As a humanitarian, Teri is dedicated to serving humanity through charitable efforts whenever she can. She is especially drawn to charities that help those in unsavory or unsafe circumstances, overcome their harmful conditions or surroundings, through empowerment and enrichment programs in education, self-care and more. For over 20 years Teri has followed the teachings of many masters and inspiring leaders, including Wayne Dyer, Marianne Williamson, Deepak Chopra, Louise Hay, Mother Teresa and The Dalai Lama. She adds that Oprah and Steven Covey have had a tremendous impact on her life. Oprah gives us all hope that we can "become anything" and Steven Covey teaches with an abundance mindset, "There are enough resources and success to share with everyone!" Today Teri is following the teachings of Thich Nhat Hanh through the Detroit Lotus Sanga and is pursuing a course in Intuitive Empowerment and Shamanic Wisdom with Lori Lipten. "Through meditation and mindfulness each and every one of us can connect with our own inner peace, creating an environment of compassion, acceptance, abundance, love - bliss." Tune in to Empower Radio as Teri Welcomes YOU to Blissville by sharing resources, stories and people on the road to bliss! Her high energy and upbeat personality are contagious; catch it today!